Based on two previous experiences with British Airways, I am a huge fan of daytime travel for eastbound flights from the eastern seaboard of the USA to Europe. Unlike the overnight journeys, which usually cause me severe jet-lag regardless of the cabin used, the day flights make it remarkably and blissfully easy not only to reduce jet-lag, but to eliminate it altogether. The trouble is, of course, that only a handful of such flights exist. Still, with these thoughts in mind, I deliberately made the effort to route my return from Florida through Washington Dulles, as this allowed me to connect onto United's flight 922: Washington - London by day. 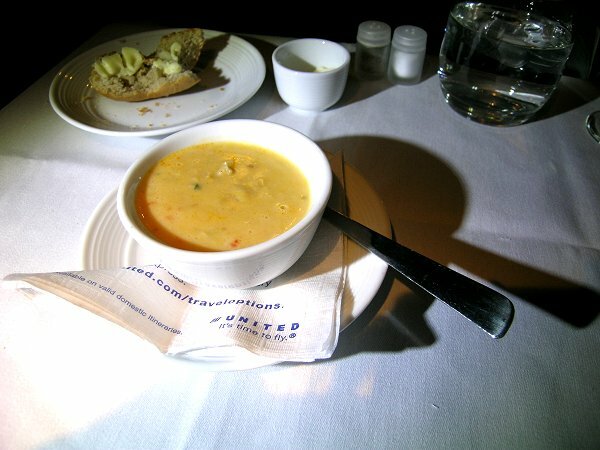 An added bonus was that it allowed me to sample United's new First Class offering, as implemented on the Boeing 767. With that background in mind, I was one of the first to board the 767 and I was eager to see what awaited me on board. I sat down in 1K and immediately wrote four words in my notebook: 'Hard product looks great!' And so it did. 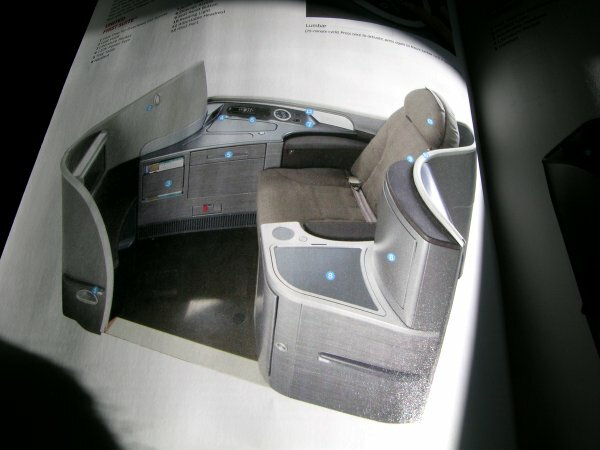 The F cabin on the 767 contained just two rows of three solo seats, with 2K reserved as the crew rest area. 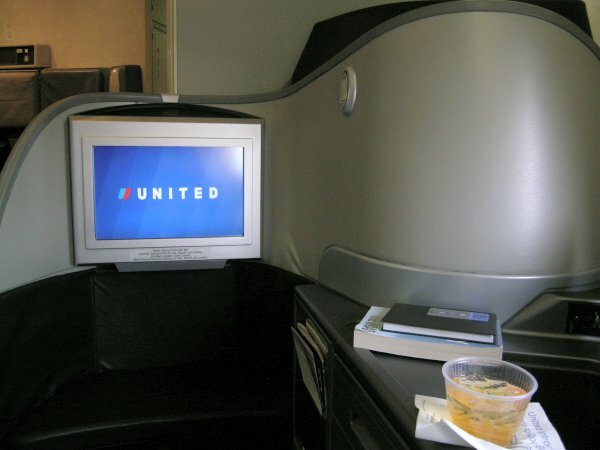 Unlike the previous incarnation of United First, where the seats were angled towards the window in BA style, these seats were angled away from the window, like the 'herringbone' layout used by a number of airlines in Business Class. But this was no Business Class seat! There was plenty of room in the seat itself and in the surrounding console. Much of what would otherwise have been dead space in the body of the console had been made available as a series of cleverly-designed storage cubby-holes which, taken together with the overhead bin space available to every passenger (including those in the centre of the cabin) added up to an impressive provision for storage. 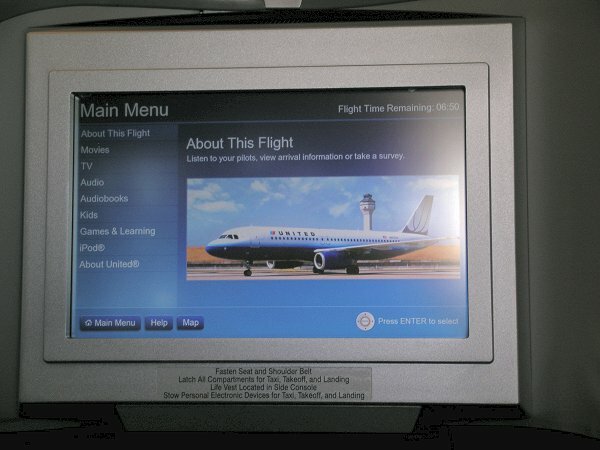 Another striking feature was the large IFE screen and the range of electrical and electronic interfaces, which even included an iPod docking station. The seat belt was also rather novel, featuring a shoulder strap that attached to the buckle of the lap belt. I only wore the shoulder strap for take-off and landing. The Captain announced the expected flight time as 7 hours, which he said was a little longer than normal due to the current absence of the customary tail winds. He also added that the IFE system's Channel 9, which allows passengers to listen in to the Flight Deck, was currently banned by the TSA. I should also add that the flight crew were Washington-based, while the cabin crew were London-based. We pushed back five minutes behind schedule and took a further 15 minutes to become airborne. My overhead bin sprang open a few seconds after take-off, causing an exchange of raised-eyebrow looks with the rear-facing crew member on the jump seat, who shut it when he judged it was safe to do so. As I continued to get used to my surroundings, I noticed that the amenity kit was much improved compared to its equivalent less than a year previously, which had been particularly cheap looking. Menus were handed out and I was intrigued to note the nostalgia-provoking Spirograph pattern on the cover! 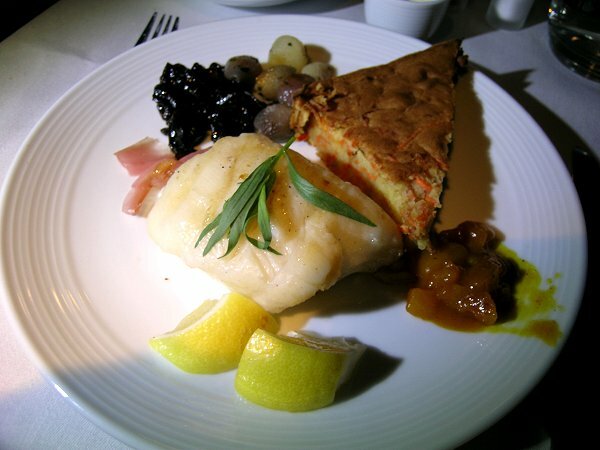 The catering plan for this flight was a light breakfast, followed by a full dinner prior to arrival in London. 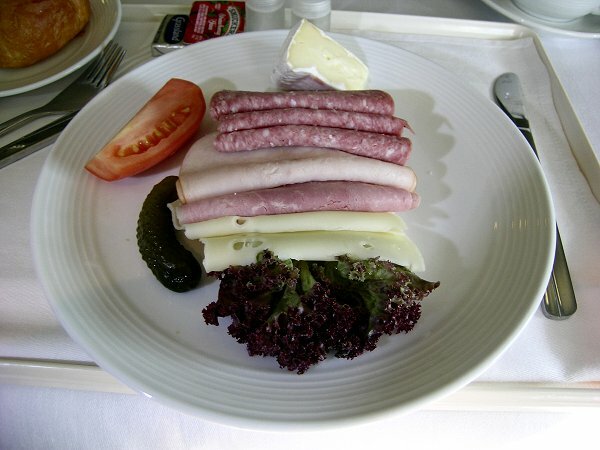 For breakfast, I had some fruit as a starter, the European selection of cold meats and cheeses and a croissant with butter and jam, all accompanied by coffee and apple juice. It was all very enjoyable. I was also offered cereal and yoghurt with my starter, but declined these. I noticed that the table suffered from the same flaw as its equivalent in BA's latest incarnation of Club World - being unsupported on one side, it tended to wobble a bit. On the other hand, I was impressed by the very slick way that it could slide in and out of storage without disturbing any horizontal surfaces on the console. 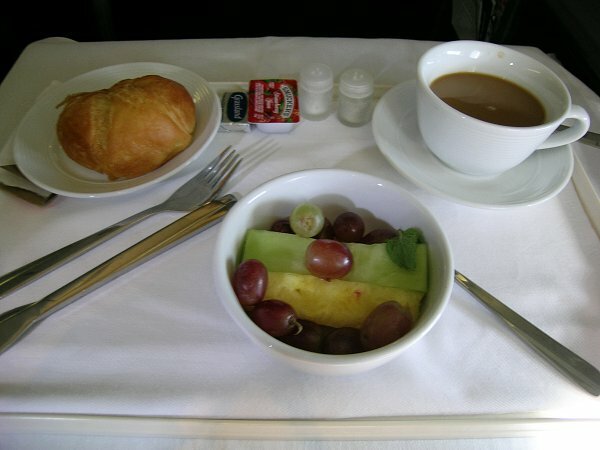 As an integral and vital part of my jet-lag avoidance strategy, I was determined not to do any sleeping on the flight and so, when the breakfast things were cleared away, I got started right away on the IFE system. The AVOD system was excellent, the menus well laid out, responsive and easy to use. I watched Terminator Salvation and then made up a playlist from the 'Classical Juke Box' which, while impressive, sadly contained little in the way of complete works. About half way through my entertainment marathon, the Purser appeared and said to me in a very traditionally British discreet manner: "Sir, are you sure you wouldn't be happier with something a little stronger than that water? Maybe a glass of wine?" "Or better still, how about something fizzy? ", I replied. He was soon back at my side with a bottle each of the Nicolas Feuillatte and the Pannier Champagnes, from which I selected the former. A little dish of warmed nuts appeared when it was top-up time, as I enjoyed a collection of clips from the US version of Whose Line Is It Anyway? I had the shrimp and corncake starter, the soup (which, despite what the menu said, was a seafood bisque), a salad with vinaigrette dressing and the sea bass main course. While lacking flair in presentation, they all tasted just fine. 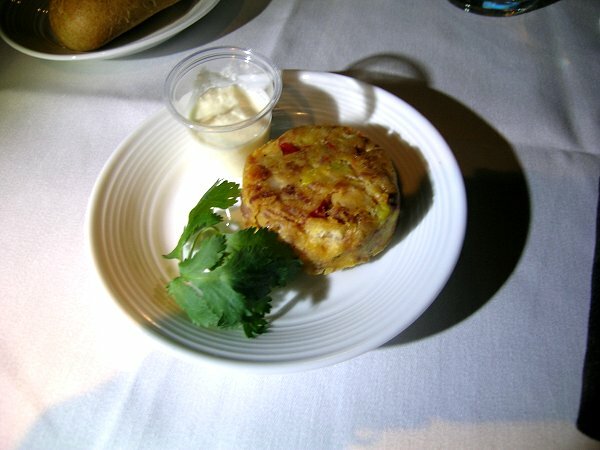 The sea bass, in particular, was cooked to perfection, with not a hint of flakiness or dryness. The Purser said a little apologetically that the choice of rolls was just white or brown, but for me that was actually an improvement from last time. One remnant of Old First that had survived intact was the plastic salt & pepper set. Come on, United - you've made some genuinely impressive improvements, so why not spend a couple of dollars more and get rid of the cheap tat! I drank the ever-reliable Meursault with my starters and main course. I then skipped the ice cream and had the cheese selection with a small glass of the delicious vintage port. A cup of coffee rounded the whole thing off very nicely. By the time all the tables had been cleared, we were over the UK and making our initial descent into Heathrow. The Captain told us that we'd be landing on Runway 27L and that the temperature on the ground was -2C. Strangely, having drunk water from a glass throughout the flight, I was then offered a little bottle of mineral water "for the journey home". We touched down at 2215 local time and, despite the long taxi required to reach Terminal 1, arrived on stand just seven minutes later. Overall, I really enjoyed this! 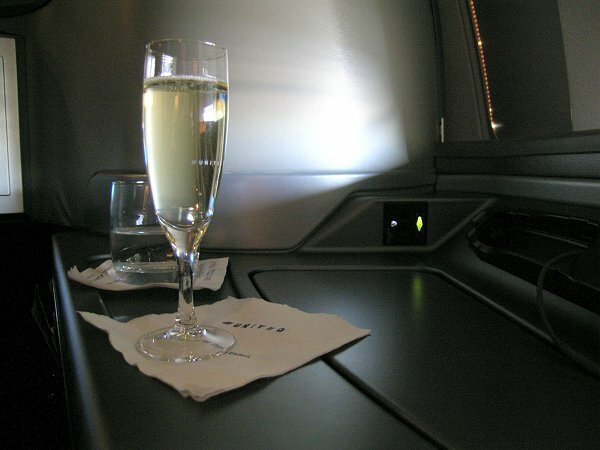 The new First seats struck me as excellent and, in the small 767 cabin, felt very exclusive. The London-based cabin crew were friendly and professional throughout. 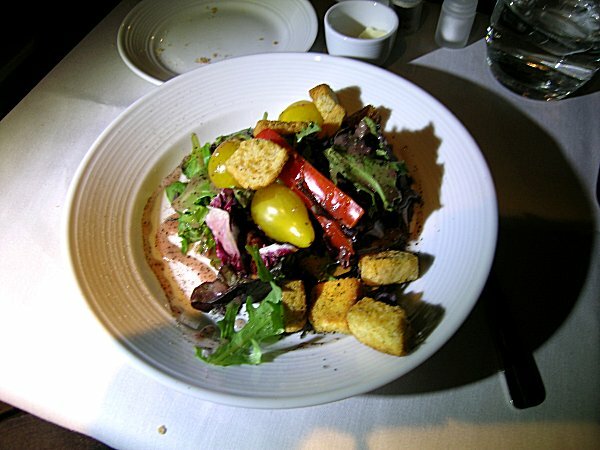 The food was a big improvement on what I had experienced less than a year previously and I thought that the wine list was perfectly respectable. The few negative points, somewhat frustratingly, came down to some small, almost silly things: plastic tat, cheap rags for hot towels, indifferent presentation of otherwise tasty food. Taking all aspects together, the experience wasn't up to the standards of Lufthansa, Swiss, Singapore Airlines or even British Airways at its best. However I felt that it was as good as some of my previous BA First experiences. I'd certainly do it again, especially on a transatlantic eastbound day flight, the intrinsic advantages of which come close to outweighing all other considerations.